Pistols, rifles and other guns, while not for everyone, they have been essential to some fantasy stories from Solomon Kane to the comic book series Skullkickers. The Weird Western and some Post-apocalyptic stories, such as Dark Tower, also feature elements of Sixguns and Sorcery. Then you have two Korean action movies, The Good The Bad The Weird (thanks +Alex Mayo) and The Warrior's Way that also mixed elements of pulpy westerns with fantasy elements. So there is obviously an appeal, but there is also a negative stigma when it comes to guns. Are they right for a fantasy campaign? It’s really up to the gaming group to decide. If the group decides to add some form of firearms to the game, they have to decide how realistic or powerful they should be. Guns can easily change the nature of the game into a gun show, instead of the traditional display of swords and spells. One way to keep that from happening is to make these weapons more trouble than they are worth. Bullets can be unstable but plentiful, or they can be dangerous but extremely rare. If guns are a regular feature of the game, maybe a little bit of both. Regardless, elements of Fantasy mixed with the Weird Wild West can make for an interesting world of adventure. If they’re powerful, they should be extremely rare. They should be treated like artifacts, and there should be dangerous rivals or factions trying to take them away from the adventurers. Imagine if the bad guys had the guns instead. With the tables turned, guns can make or break the game by annihilating a party. But if they are a staple of the campaign, it’s probably best to make them pretty mundane and not much different than any other missile weapon. But if that is the case, why have them at all? Consider limiting the weapons to only black powder, or non-automatic revolvers and bolt-action or lever-action long guns. If the group decides to make firearms powerful, apply any number of optional rules found below. It’s important to remember that combat in Swords & Wizardry is abstract. Each attack roll represents a series of attacks, maneuvers, dodges and parries. So though a character may have been hit by an attack, it doesn’t always represent a bullet breaking skin. Normally, when hit by a high velocity slug, it would almost always cause devastating damage. But instead, they should be described as near-misses and flesh wounds until down to that last hit die of hit points. Surprise and Initiative works like normal. Firearms follow the same attack rules as missile fire, they are fired during the Movement and Missiles Phase. Each firearm has its own damage die; typically d8 for handguns and d10 or more for longarms. For a standard attack, a hit does 1 die of damage. Damage is treated just like any other missile or melee attack, and can be healed as normal. The shooter may take a round to aim to increase the attack roll by 2 and hits will increase the damage by an additional die. But the shooter is vulnerable to normal attacks (including surprise attacks and critical hits, see below) while aiming. Taking cover is key to surviving a gun fight. Especially if guns are especially dangerous. The group should decide whether to make gun battles realistic and gritty, like a World War 2 movie, or to make them cinematic and showy, like The Matrix. In realistic gun battles, half the time the combatants are ducked and covered. While in more gun-fu style movies, gunplay is out in the open. If guns are mundane and common, the abstract nature of S&W combat is sufficient enough to assume cover. But if the more dangerous optional rules are used, cover is essential. For simplicity, if a target is actively hiding behind hard cover, no attacks can be made. If the target is firing back from behind some hard cover, the cover provides an additional 4 points (-4 [+4]) to AC. Firing from a firing port, murder hole or arrow slit can provide up to 8 (-8[+8]) points of AC, at the referee’s discretion. High-noon on the dusty road, in the middle of town; it’s the typical setting of a one on one battle between two rival gunmen. It’s usually resolved with a single shot from the fastest gun. If two gunman agree to a duel, hit points are practically off the table and the winner is determined by who hits whom first. Initiative is determined between the two duelists, using a d20, the roll is modified by the character’s level (and any other circumstantial modifiers, see below). The highest roll shoots first, and an attack roll is made as normal. If the attack hits, the damage is the number of damage dice equal to the PC’s level or a creature’s Challenge Level. For example, a typical handgun does d8 damage, so a 5th-level fighter that hits during a duel does 5d8 damage to his target. This represents an automatic critical hit and the inability to dodge (maneuver, parry, etc.). Let’s face it, duels are deadly against experienced adventurers. If the target survives, he can attempt to shoot back applying the same damage rules. If both duelists survive, combat rounds continue as normal combat. At that point damage is normal (typically one die), initiative is handled normally, and others may join the combat if they wish. For simplicity, rounds cost are dependant on how much damage they do. For black powder weapons, the costs include the necessary black powder. *Costs are for 10 rounds where firearms are mundane. In campaigns where firearms are rare, costs are for a single round. Magazines and quick-loaders cost 1 gp for each if firearms are mundane or 1 gp per round they carry in campaigns where firearms are rare. The following are rules to make guns more dangerous and gritty. The more powerful firearms are in the game, the rarer they should become. Firearms should remain unique and difficult to obtain. The following rules may supplement, replace or be replaced by existing house rules, such as Critical Hits and Fumbles. Firearm attacks during a surprise round, or the target is otherwise unaware of the attack, will increase the chance of a critical hit by 2. That is, if the attack roll is a natural 18+ and the attack hits, the attack should be considered a critical hit (see below). All other surprise rules still apply. This rule does not apply to automatic fire. On a natural 20, an attack with a firearm should be considered a critical hit. A critical hit does damage equal to the attacker’s level or challenge level in damage dice. For example, a succubus with a pistol can do 9d8 damage on a critical hit! A natural 1 may represent a misfire. 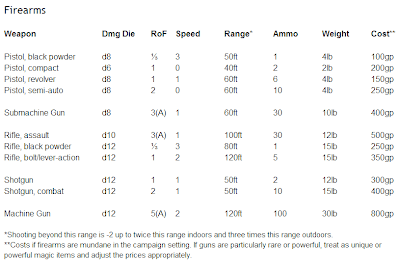 The weapon may be permanently damaged (1% chance) and a 1 in 10 chance firer may be also be injured by a misfire or explosion, 2 dice damage (die type depending on ammunition used), save for half. Firearms will have a Rate of Fire (RoF) rating, reload time and weapon speed. These are not so important if guns are mundane, treat them as any other missile weapon. But as a way to make firearms inconvenient, especially if they’re extremely powerful, these factors may help keep them in check. Rate of Fire: A firearm with multiple RoFs may only fire once during the surprise round, but the chance of a critical hit should increase as per the Surprise Attack rule above. Automatic weapons are indicated by an (A). Reload: Reloading a firearm manually can take up to a minute. If quick loaders or magazines are available, reloading takes one round. Black powder weapons can take up to 3 rounds to reload. Weapon Speed: Weapon Speed is only a factor for individual initiative rolls, such as duels (see above). This value is added to the initiative roll or, if using Alternate Combat Sequence Method No. 3 the value is negative. Weapons with a RoF that indicates an (A), instead of separate attacks, automatic weapons can affect multiple targets in a 10-foot square area. An automatic fire attack uses 10 rounds of ammunition. The attacker makes a single attack roll that’s compared to the AC of each target in the area. A hit causes 3 dice worth of damage, save for half. A critical hit (natural 20) does 6 dice of damage, save for half. ...and Firearms!, Copyright 2013, Reverend Dak.